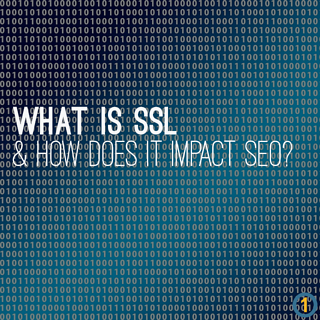 What is SSL & How Does it Impact SEO? The team here at P1WS is constantly being asked all sorts of questions by our clients about SEO. At times these questions are very basic such as, “do meta-tags impact my website rankings?” (For those still wondering the answer to this question… the answer is NO and it’s been that way for many years now.) Other times we get more currently relevant questions, as I did recently. One of my long time clients sent me an email asking me about how SSL impacts search engine rankings. I immediately replied because this topic is one that I have been addressing with my clients for a couple of years now. SSL is an acronym for secure sockets layer, which is a standard security technology (think encryption - which is a very controversial topic these days… but I will save that discussion for a future blog!). The idea that having an SSL certificate on your company website isn’t new… in fact Google started informing the web world that it would start to take SSL into account as part of their ranking algorithm at least 18 months ago, as you can see in this article from our friends at Search Engine Land. When you really think about it, what is it that we talking about here? We are talking about a more secure internet! As more people adopt technology to perform everything from online banking to submitting personal information when requesting a quote, a more secure internet is in everyone’s best interest. Google has obviously decided to reward those site owners that contribute to this cause. In fact, a recent article by Brian Dean at Backlinko contends that SSL has a reasonably strong correlation with first page Google rankings… and he considers this in the top 5 of his key findings. This is the easy part… install an SSL certificate on your entire website! For those that have never dealt with SSL before it’s not as daunting as it might seem. There are many places to purchase a SSL certificate for less than $100/year, including your web hosting company, most likely. In fact, there is even a non-profit organization that is giving away FREE SSL Certificates! For P1WS clients, our team is ready to take care of everything for you! All you need to do is indicate to us that you would like to help yourself with better rankings, and the web community at large, by doing your part to make the internet a more secure place by contacting your project manager.